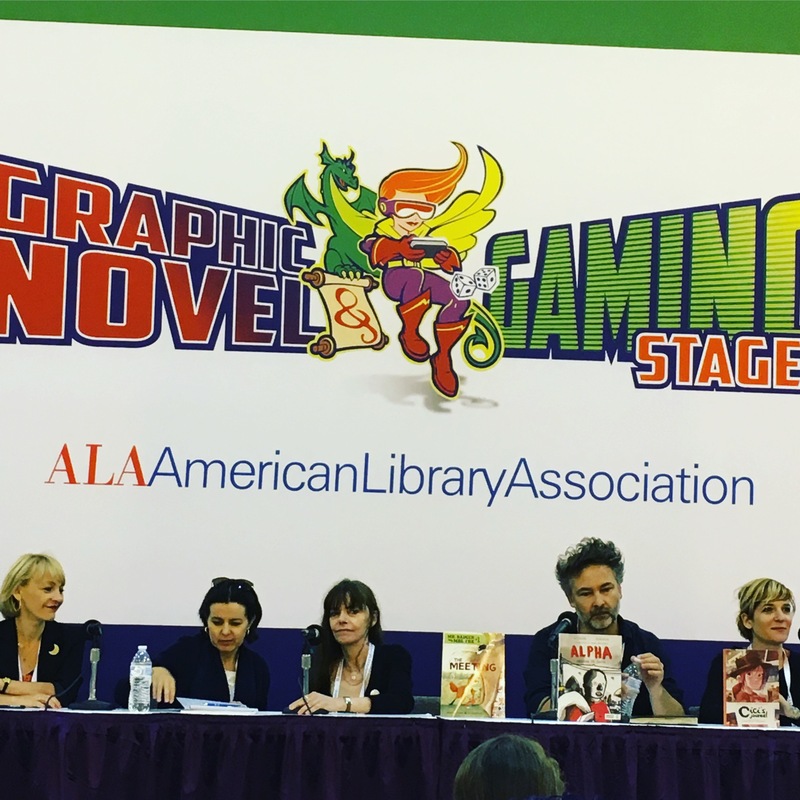 Yesterday was an amazing start to my weekend in New Orleans at the 2018 ALA Conference! 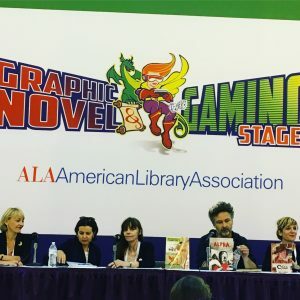 Not only did I have the distinct pleasure of co-presenting for the first time at ALA (Shout-out to fellow live blogger Soline Holmes for her post about my session) but I attended some great programs and discussions! I particularly enjoyed the panel discussion “French Comics Kiss Better: Bande Dessinee 101” which took place at the Graphic Novel and Gaming Stage in the exhibits hall. This program, sponsored by the French Comics Association, included some of my favorite creators of youth graphic novels- such as Aurelie Neyret, author of Cici’s Journal. 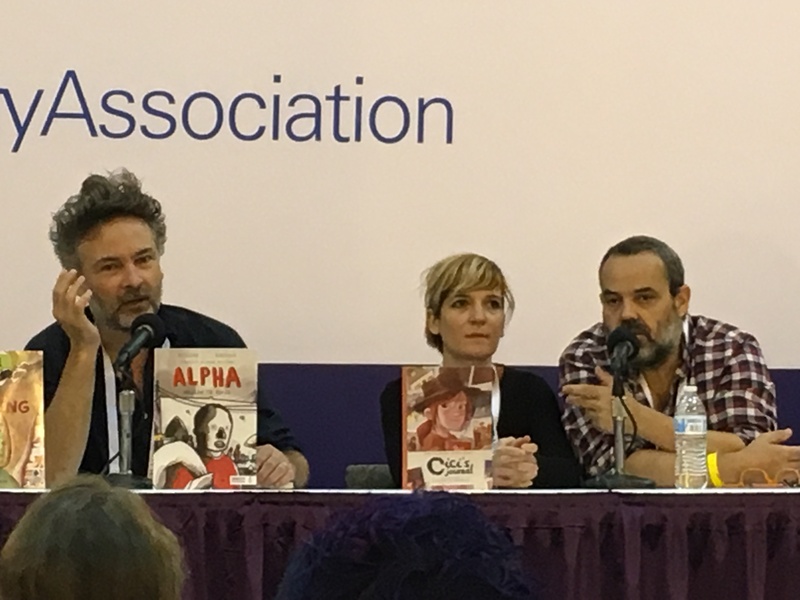 Other creators on the panel were Eve Tharlet (Mr. Badger & Mrs. Fox), Cati Bauer (Four Sisters) and Barroux (Alpha). These authors and illustrators discussed their work process, the challenges of getting their works into the American market, translations and more. They also shared stories about their own experiences with libraries and inspiration for their graphic novels. I loved hearing Aurelie talk about how she grew up reading comics like Tintin but never really connected with many French comics because there were not any strong female heroines. When creating Cici’s Journal she wanted to write a story with such a protagonist, a main character young girls could relate to or find exciting. I definitely think she succeeded! I was lucky enough to have her autograph a copy for me after the presentation and thank her for creating such an awesome book. This post addresses the following ALSC Core Competencies: I. Commitment to Client Group and IV. Knowledge, Curation, and Management of Materials.